Big Band Library: February 2012 "Big Band News"
"GM's music was my first exposure to big band and I immediately fell in love with it," Hilscher explained to me. "I was twelve years old at the time and had seen a movie with Jimmy Stewart, 'It's a Wonderful Life.' Jimmy Stewart reminded me of my grandfather and something about Stewart struck a chord with me. So, I think that my second Stewart movie was 'The Glenn Miller Story.'" That motion picture was originally released in January 1954, and since then, it has helped to bring Miller's music to several new generations of fans. "After seeing the movie, my folks took me to a music store where I found a tape of Glenn Miller and His Orchestra. It was a compilation of live recordings of Glenn's civilian band. And that 'sealed the deal' for me," Hilscher recalled. "From then on out, I was the kid at school who listened to 'that old music.' But I loved it…and next thing you know, my friends were loving it as well!" In 1997, Hilscher sent a demo tape to Larry O'Brien and received a call from the band's Road Manager about a week or so later. "I then did a live audition with the band for the vocal chair, and started singing with the band in the Summer of '98," Hilscher said. "I worked with the GMO until the Spring of 2005, so that I could marry my college sweetheart, whom I had been dating during those years on the road. Now, in early 2012, we have three children and life is certainly moving quickly." Already, positive reports about Hilscher's appearances with The Glenn Miller Orchestra are coming in. "Working under the direction of Larry O'Brien for all those years, I learned quite a lot in regards to his style of performances. So, one can certainly say that I'm a student of Larry O'Brien," Hilscher observed. "Larry learned so much during his pre-GMO career, working with Sammy Kaye, Sam Donahue & the Tommy Dorsey Orchestra, and then working as the leader of Frank Sinatra, Jr's 'Little Big Band' (as Larry used to call it). Larry brought a lot to the GMO when he arrived. So, with such a great 'teacher', I will be following Larry's lead in a lot of areas, especially in regards to the style of show that will be performed." Already, Hilscher has begun including some lesser-known selections from the band's book, including two arrangements from the McKinley era, Chicago and I'm Glad There Is You. "With my love for GM's music, my plan in regards to the music that is played at our shows will be to delve deep into the Glenn Miller Orchestra library and pull out some great treasures that I know are there," Hilscher acknowledged. "In regards to the way that I will approach this music, I'll be taking my lead from the original recordings of Glenn Miller and His Orchestra, and attempt to get as close to that sound as possible. I have a large library of live recordings of GM's band and will be taking a lot of direction from those recordings as well. There are lot of subtle nuances in the way that band played the music, and I'd like to recreate those things as much as possible. Of course, we'll be doing the 'hits' each and every night: String of Pearls, Pennsylvania 6-5000, Tuxedo Junction, Chattanooga Choo Choo, In the Mood, Little Brown Jug, Moonlight Serenade, etc." At this time, with Hilscher singing as leader and Brian Hemstock still present, the band has two featured male vocalists. "In regards to the vocal position on the Glenn Miller Orchestra, I will sing a couple of solos at each performance. However, Brian Hemstock will stay on with the band for the next several months," Hilscher reported. "Brian is a great singer and has a lovely voice. He is getting married this Spring and will be leaving the road at that time. We wanted Brian to stay on and continue to be the featured vocalist until he leaves in order to get married." Just before the job offer from Glenn Miller Productions was made, Hilscher had been acting as frontman for The Tommy Dorsey Orchestra, since Buddy Morrow had passed away in September 2010. "In regards to the Tommy Dorsey Orchestra, I would like to add that I'm very thankful for this past year, working as the leader of the TDO. I'm also grateful for the time that I had working alongside Buddy Morrow," Hilscher remarked. "The TDO is a great band and will continue to perform the Dorsey music throughout the year." 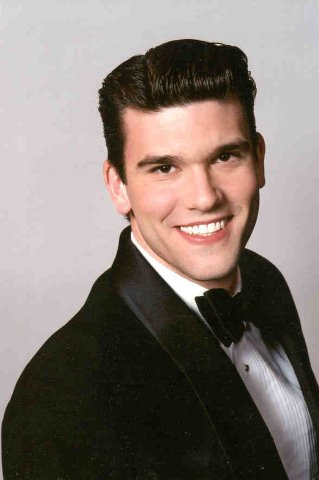 I wish Nick Hilscher much success and enjoyment in his new role with The Glenn Miller Orchestra! "Thank you again," he said. "I'm looking forward to presenting this great music with this wonderful band to audiences throughout the world." 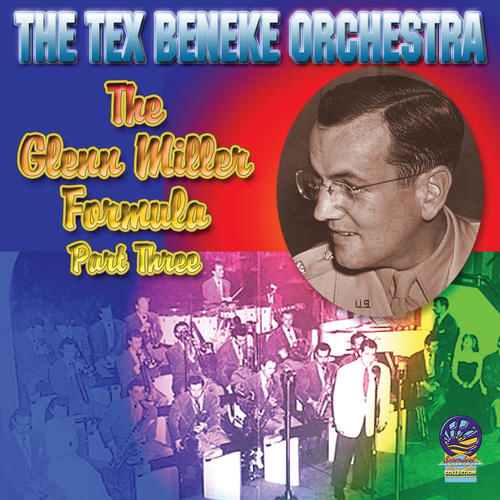 Longtime Tex Beneke aficionado Michael Highton continues to honor Beneke's career as one of the most beloved of all the Glenn Miller Orchestra alumni, with a new CD release, "The Tex Beneke Orchestra: The Glenn Miller Formula Part Three" (Sounds of YesterYear [ UK ] DSOY878). FEBRUARY 2012 "BIG BAND NEWS"
At the end of 2010, trombonist Larry O'Brien gave up leadership of The Glenn Miller Orchestra after more than 20 years. He was succeeded by another trombonist, Gary Tole, who directed the group for just one year. Both had previously worked as sidemen in the Miller Orchestra under others (O'Brien with Ray McKinley briefly in the early 1960s, and Tole for Jimmy Henderson for several years during the 1970s). Now, Glenn Miller Productions has selected another former member of the world-famous Orchestra, vocalist Nick Hilscher, to take over its reins in the U.S., so I recently sent my best wishes to him. "It's very good to hear from you," Hilscher responded. " And thank you for the congratulations! . . . I've been spending the last couple of weeks in preparation for (once again) living on the road. However, I'm very much looking forward to it and am excited to return to the Glenn Miller Orchestra, this time as the Musical Director." Hilscher's first performance in his new position was last month. leader of The Glenn Miller Orchestra. Photo courtesy Glenn Miller Productions, Inc.
Jimmie Joy. "Jimmie's Joys," Jazz Oracle [ UK ] 8067. Recordings made from 1923-28. Guild, Pittsburgh, PA; Feb. 25, Mary D'Angelo Performing Arts Center, Erie, PA; Feb.
26, Berrie Center for Performing and Visual Arts, Mahwah, NJ. Jimmy Dorsey Orchestra directed by Bill Tole. Feb. 1, Happy Trails Resort, Surprise, AZ. Hotel, Bossier City, LA; Feb. 25, McSwain Theatre, Ada, OK.
Tony Bellson, 85, d.Feb. 20, 2012. Brother of drummer-bandleader Louis Bellson. Ray Lamere, 82, d.Feb. 22, 2012, cancer. Vocalist with Kaye Orchestra '89?-'11. Red Holloway, 84, d.Feb. 25, 2012, "kidney failure and complications from a stroke." Feb. 26, 2012. Doc Severinsen - a trumpeter with FioRito '45, Barnet '47-'49, S.
In next month's "Big Band News," I will give details of an upcoming celebration of the 100th anniversary of the birth of Les Brown, and word of two new big band programs airing on PBS-TV. It contains more of Beneke's 1949 Thesaurus transcription recordings, some of which, such as Sunrise Serenade and Elmer's Tune, reflect Miller's popularity, while others, like the Latin-flavored El Cumbanchero, La Rosita, and Senorita, expand the Miller-styled repertoire. With rare performances, good sound quality and a colorful cover design, the disc is an essential purchase for Beneke fans. Meanwhile, as shown later in this report, The Tex Beneke Orchestra, under the direction of saxophonist Jim Snodgrass, continues to make occasional appearances nowadays, along the West Coast.